The subtitle says it all really - it was a war and it was a revolution. Respected technology and media writer Fred Vogelstein has written an amazingly detailed and lucid account of the incredible corporate drama around the invention of Apple's iPhone and Google's competitor the Android operating system. He gets inside the two companies by talking to many of the key managers and engineers involved from day one. There's much more than technical and design stuff here, though there's plenty of that. There are highly personal stories of friendships destroyed, betrayals, enmities, hatreds, etc. All the rich details that make this recent history so fascinating and important. I really couldn't put this book down. It reads like a novel - a blow-by-blow intense unfolding story. 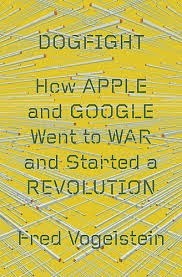 And it brings Steve Jobs and his management style alive, as well as Google's Sergey Brin, Larry Page and Eric Schmidt.